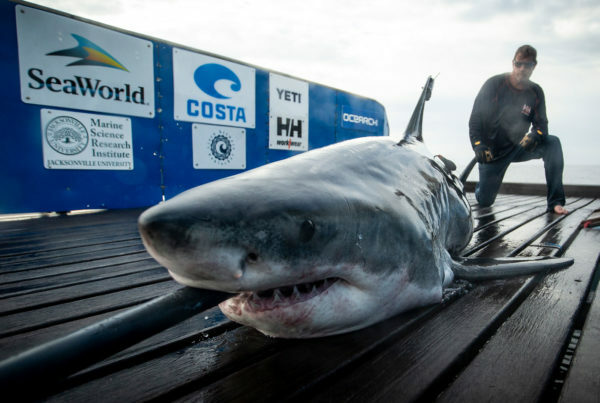 Tracking data from white sharks equipped with OCEARCH satellite tags reveals that the Atlantic continental shelf waters off North Carolina, South Carolina, Georgia, and the east coast of Florida are a winter hot spot for large white sharks. As seen on the OCEARCH Tracker, the heavy concentration of our adult and near-adult white sharks in this region suggests it’s an important winter habitat, which OCEARCH and collaborating scientists are now referring to as the Northwest Atlantic Shared Foraging Area (NASFA). This is in concordance with fisheries data that showed this area to be a wintering ground for white sharks, as previously published by OCEARCH collaborator Dr. Tobey Curtis and his colleagues. The OCEARCH Tracker shows at least eight white sharks have been detected in the NASFA in the past week, including adult white sharks Hilton and Katharine. The eight sharks are a good indication there are plenty more white sharks in the area with them. The waters off Charleston, South Carolina and Cape Canaveral, Florida have seen the highest concentration of detections. 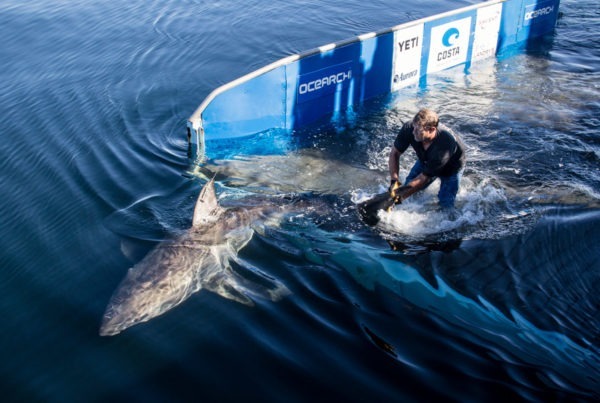 The sharks were tagged as part of an ongoing study started in 2012 by OCEARCH to uncover the mysteries of white sharks’ life history in the Northwest Atlantic. Since the beginning of the study, OCEARCH has consistently observed that nearly all tagged, large white sharks in the Northwest Atlantic visit the NASFA at some point during their migrations, with most visiting in the winter. OCEARCH has tagged white sharks as far south as Florida and as far north as Nova Scotia, Canada, and all of the larger tagged sharks have spent some time in the NASFA. The tendency for white sharks to migrate to the NASFA bears some similarities to white shark behavior observed in the Pacific Ocean off the west coast of the United States. In the Northeast Pacific, different shark populations migrate from the Farallon Islands and Guadalupe Island to a Shared Foraging Area (SOFA), also popularly referred to as the White Shark Cafe, between the Baja Peninsula and Hawaii. OCEARCH tracked this white shark behavior in 2007-2009 and conducted a 30-day expedition to the SOFA in 2009. 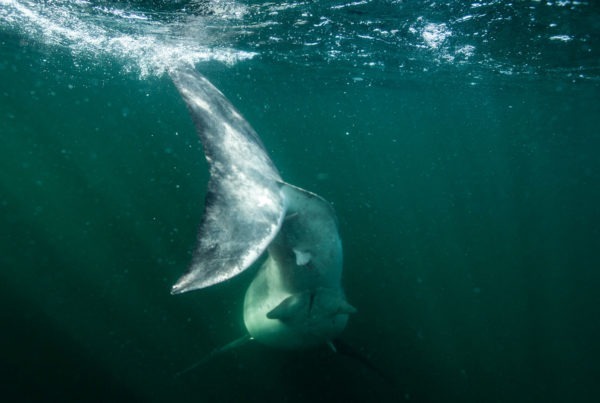 Studies by other scientists since then have tracked similar shark behavior. OCEARCH tracking data in the Atlantic suggest there could be more than one population, or subpopulation, of white sharks inhabiting the Northwest Atlantic. These populations are differentiated by where the sharks aggregate in the late summer and fall, which is suspected to be mating season for the species, although that remains to be confirmed. Cape Cod, Massachusetts is one such summer/fall aggregation site and OCEARCH data indicates there is at least one more summer/fall aggregation site in Canada. Regardless of which summer/fall aggregation site a shark uses, however, it appears nearly all of the adult and near-adult sharks visit the NASFA during the colder winter months. 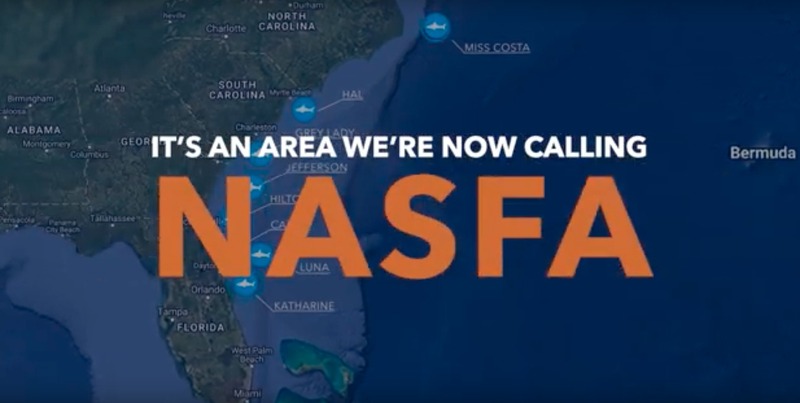 OCEARCH is planning an expedition to the NASFA in February and has two other expeditions planned to try and tag more sharks off Massachusetts and Nova Scotia later in 2019. These expeditions aim to increase the sample size of tagged white sharks to get a clearer picture of white shark movements in the Northwest Atlantic and test scientific hypotheses about white shark movement and migration. Follow the sharks through their migration cycles by accessing the near-real-time OCEARCH Tracker.